Humphry Davywas born on December 17, 1778 in Penzance, Cornwall, England. He received his education in Penzance and in Truro. His father died in 1794, and Davy, in an effort to help support his family, became an apprentice to a surgeon-apothecary. Davy's most important investigations were devoted to electrochemistry. Following Galvani's experiments and the discovery of the voltaic pile, interest in galvanic electricity had become widespread. The first chemical decomposition by means of the pile was carried out in 1800by Nicholson and Carlisle, who obtained hydrogen and oxygen from water, and who decomposed the aqueous solutions of a variety of common salts. Davy, too, began to example the chemical effects of electricity in 1800. He soon found that when he passed electrical current through some substances, these substances decomposed, (a process later called electrolysis). In 1813, Sir Humphry Davy concocted a giant battery in the basement of Britain's Royal Society. It was made of 2,000 pairs of plates and took up 889 square feet. The intensity of its effect (the voltage generated) was directly related to the reactivity of the electrolyte with the metal. Evidently, Davy understood that the actions of electrolysis and of the voltaic pile were the same. His work led him to propose that the elements of a chemical compound are held together by electrical forces. Davy must have known of Lavoisier's suggestion that the alkali earths were s of unknown metals. At first, he tried to separate the metals by electrolyzing aqueous solutions of the alkalis, but this yielded only hydrogen gas. He then tried passing current through molten compounds, and his persistence was rewarded when he was able to separate globules of pure metal by this means. His first successes came in 1807 with the separation of potassium from molten potash and of sodium from common salt. He described potassium as particles which, when thrown into water, "skimmed about excitedly with a hissing sound, and soon burned with a lovely lavender light." 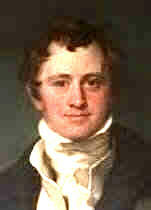 Dr. John Davy, Humphry's brother, said that Humphry "danced around and was delirious with joy" at his discovery. These results were presented in the Bakerian lecture of November, 1807. Through electrolysis, Davy eventually discovered magnesium, calcium, strontium, and barium in 1808. For all these discoveries, much groundwork had of course been done by others. Davy utilized the reducing power of potassium to prepare boron, and he developed the method of separating potassium from sodium based upon the insolubility of potassium perchlorate and the solubility of sodium perchlorate in 97% alcohol. In 1801, the Royal Institution in London engaged Davy as a public lecturer. Michael Faraday began attending Davy's lectures in 1810. In December, 1811, Faraday impressed Davy by sending him copious bound notes of these lectures, including exact drawing of Davy's apparatus. The previous October, Davy had been temporarily blinded by an explosion in his laboratory, and he needed help. He hired Faraday at once, beginning a close personal and professional association that lasted for years. Davy twice opposed the election of Faradayto fellowship in the Royal Society. At one point he objected to honoring Faraday for achieving the first liquefaction of chlorine, claiming that he himself deserved credit for the feat. Another time, Davy said his opposition was due to his belief that William Wollaston (1766-1828) had preceded Faraday in discovering electromagnetic rotation. Perhaps Davy had simply become envious of his (successful) former assistant. Faraday did finally become a Fellow of the Royal Society in 1824. Davy's chemical lectures and demonstrations were brilliantly presented and became a fashionable social event. He also lectured and wrote a book on agricultural chemistry and presented the first systematic geology course offered in England. His first Bakerian Lecture won a prize from Napoleon, even though France and England were at war.